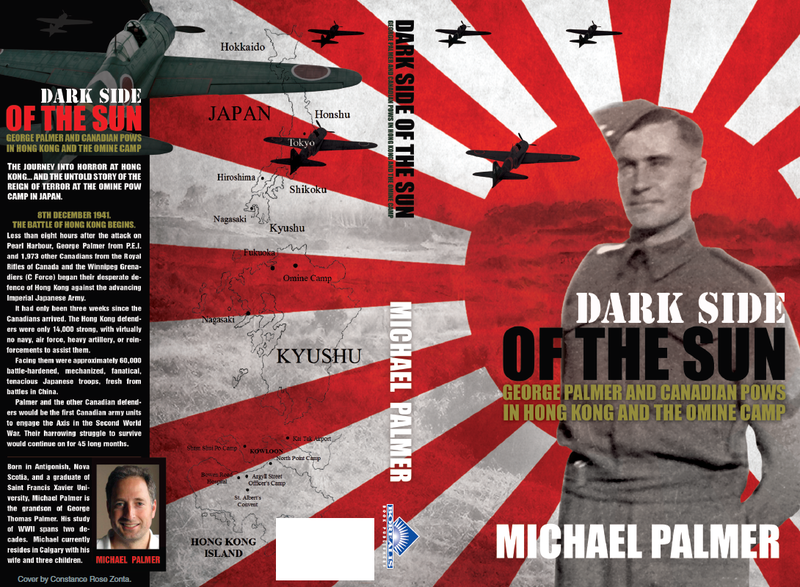 Incorporating 20+ years of research on WWII topics, Dark Side of the Sun chronicles a soldier’s exploits during WWII involving the Battle of Hong Kong and the untold story of the Omine Camp in Japan where 700 POWs (American, British, Australian, Dutch and Canadian) were interned. It’s the only published book in existance involving the happenings that went on at this POW camp. The journey into horror at Hong Kong… and the untold story of the reign of terror at the Omine POW camp in Japan. 8th December 1941. The battle of Hong Kong begins. Less than eight hours after the attack on Pearl Harbour, George Palmer from P.E.I. and 1,973 other Canadians from the Royal Rifles of Canada and the Winnipeg Grenadiers (“C Force”) began their desperate defence of Hong Kong against the advancing Imperial Japanese Army. It had only been three weeks since the Canadians arrived. The Hong Kong defenders were only 14,000 strong, with virtually no navy, air force, heavy artillery, or reinforcements to assist them. Facing them were approximately 60,000 battle-hardened, mechanized, fanatical, tenacious Japanese troops, fresh from battles in China. Palmer and the other Canadian defenders would be the first Canadian army units to engage the Axis in the Second World War. Their harrowing struggle to survive would continue on for 45 long months.